Imagine standing in a lush semi-tropical forest with a 200 foot canopy of conifers and tropical flora. Slow moving streams and swamps populated with fish, clams, fallen logs and reptiles moved like blue ribbons that drained into an inland sea. A range of volcanic mountains called the Mogollon Highland filled the southern skyline, the source of the streams and rivers. It's a scene that's hard to imagine 225 million years later. The land we see today is an arid desert scattered with wood that has since turned to stone. Petrified wood is real wood that has turned into rock composed of quartz crystals. 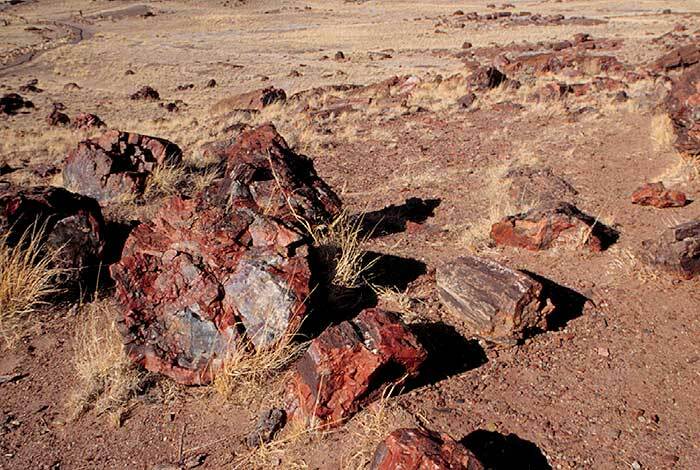 One of the greatest concentrations of petrified wood in the world is found in the Petrified Forest National Park in northeast Arizona. Logs as long as 200 feet long and 10 feet in diameter have been found in the park. What turned the wood to stone? 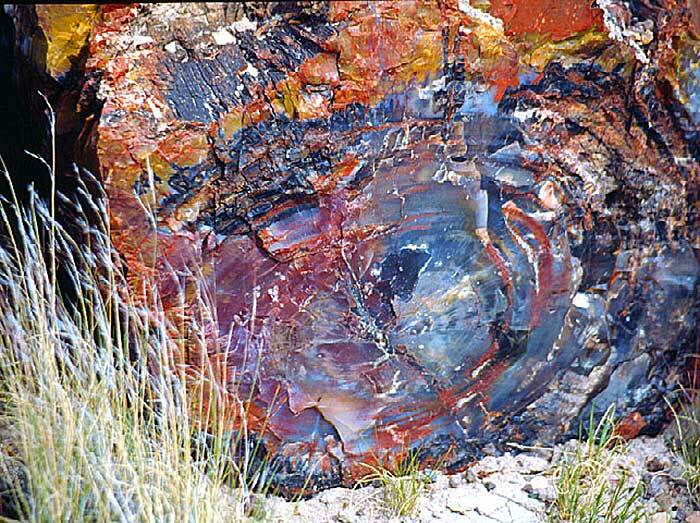 Petrified wood has been preserved for millions of years by the process of petrification. This process turns the wood into quartz crystal which is very brittle and shatters. Even though petrified wood is fragile, it is also harder than steel. Petrified wood is known for its exquisite color and detail. Some pieces of petrified wood have retained the original cellular structure of the wood and the grain can easily be seen. Petrified wood can be found throughout the desert regions. It's easy to find and identify. It's used often in jewelry making and for other types of decorative artwork. The process of petrification begins with three raw ingredients: wood, water and mud. Petrification of the wood found in the Petrified Forest began during the Triassic Period when primitive conifers fell to the ground and into the waterways on a journey through time. The logs were swept and tumbled downstream along with sediment and other debris. The streams traveled through a plain of lakes and swamps where wood, sediment and debris were deposited along the way. In fact, 400 feet of sediment was deposited in the plain by the rivers that originated from the volcanic mountain range. The layer of sediment is known today as the Chinle Formation. As the logs were deposited in the plain they were buried with mud, water and debris. This is when the petrification process began. The mud that covered the logs contained volcanic ash which was a key ingredient in the petrification process. When the volcanic ash began to decompose it released chemicals into the water and mud. As the water seeped into the wood the chemicals from the volcanic ash reacted with the wood and formed into quartz crystals. As the crystals grew over time, the wood became encased in the crystals which over millions of years, turned the wood into stone. How did the tropical forest become a desert? The petrified logs were buried in the sediment for millions of years, protected from the elements of decay. During this time the plain was covered by an ocean and another layer of sediments on top of the wood-rich Chinle Formation. Then, 60 million years ago, the ocean moved away and the erosion process began. More than 2,600 feet of sediment have eroded to expose the top 100 feet of the Chinle Formation. 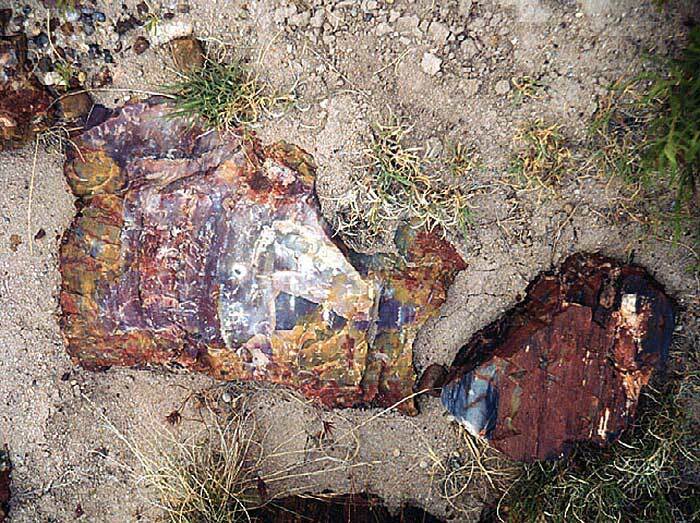 What makes petrified wood colorful? It's not wood that makes petrified wood colorful, but the chemistry of the petrifying groundwater. Minerals such as manganese, iron, and copper were in the water/mud during the petrification process. These minerals give petrified wood a variety of color ranges. Quartz crystals are colorless, but when iron is added to the process the crystals become stained with a yellow or red tint.